Patagonia puts the vibrant energy of Middlebury, Vermont, into the motion-friendly Ukiah Jacket. 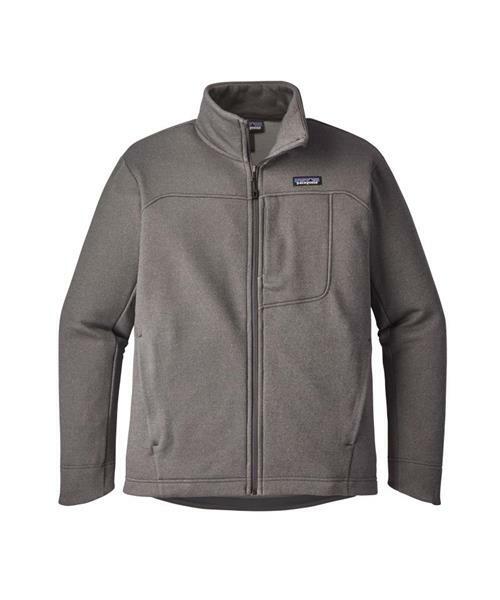 This movement-oriented fleece jacket provides casual comfort with an urban-friendly look and feel that’s equally at home hiking wooded trails or sipping a cold one at the end of the day. Made of 100% polyester (50% recycled) heathered mesh-face fleece, the Ukiah is designed with glued seams to minimize bulk and a modern silhouette to help you slip easily through the crowds. The center-front zipper features a stand-up collar to warm your neck and a zipper garage to protect your chin. Details include set-in sleeves for long-lasting wear, external drop-in handwarmer pockets, a headphone-compatible, zippered left-chest pocket for essentials, a drop-tail hem and a hip length that pairs well with other layers.